The Take That frontman has penned the score for a new Broadway production of musical 'Finding Neverland' - which is about the life 'Peter Pan' author JM Barrie - and the show has opened to critical acclaim. A soundtrack of the production's music featuring recordings by an array of pop artists such as Rita Ora and John Legend is also being released and Gary believes he is now finally going to crack America at the age of 44. "I did in the 90s, but I honestly haven't considered it since. It's fallen at my feet. Gary tried to make it Stateside when he went solo in 1996 but it never happened for him in the American charts. 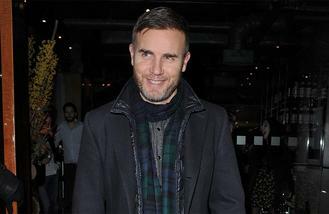 He recalled: "I tried hard when I went solo after Take That split. 'Back For Good' was a hit here and I was signed to RCA Records. "I did a nine-month radio tour, I gave it a real go. I had two albums but we never got close." However, if he does achieve success in America, Gary accepts he may lose his anonymity in the country, especially in his favourite city New York, but it's a trade he's willing to take. He said: "I do love to be able to grab a cup of coffee and sit outside a restaurant, I love it."